It looks like she will be all over the place soon! She is growing so quickly! She's too big! 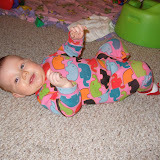 We'll get to do the "crawl aleart" with her at Thanksgiving :) I figure she'll be walking before Sarah!